Another household tip for you. 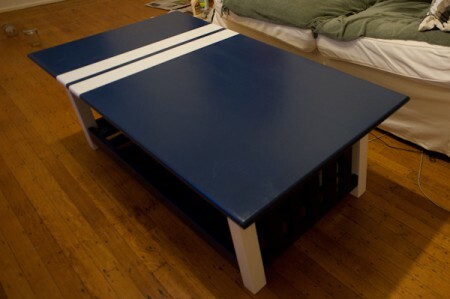 Don’t use latex paint for furniture. I was planning on painting my coffee table recently. I described the plan to the guys at my local Ace and they recommended latex paint. I sanded it down, primed it and painted it with two coats. After it had tried sufficiently, I found that it was still tacky. As it turns out, latex paint is a horrible choice for furniture because it stays tacky for a long time, especially with things resting on it. A month after I’d painted my table, everything from paper to cloth to dust paint was still sticking to the paint. In the end I covered it with a coat of shellac which got rid of the tackiness, but it may speed degradation in the long term. A better solution would be oil-based paints or an enamel.